The Original Real Easter Egg, the first and only Fairtrade chocolate Easter egg to explain the Christian understanding of Easter. The 2019 edition has a new A5, 24 page Easter storybook, a high quality Fairtrade 125g milk chocolate egg and a pack of Fairtrade Swiss milk chocolate Chunky Buttons. 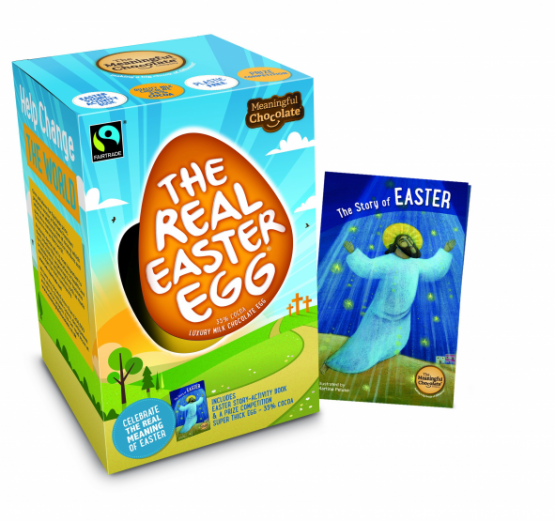 The Real Easter Egg has a plastic free design and includes a large 24 page Easter story-activity book, a prize competition and a super thick milk chocolate egg (150g) with a lovely creamy taste. 35% cocoa – palm oil free. Minimum, Milk Solids 20% Minimum. Sugar, Cocoa:traded in compliance with Fairtrade Standards, total 77%. Visit www.info.fairtrade.net Allergy Advice:For allergens see ingredients in bold. May also contain nuts and Gluten. Suitable for Vegetarians.